Then there was the journalist at a vocational guidance class who told me that Chinese people couldn’t be journalists in Canada and I wanted to be a writer. Worse of all for any teenager, no one ever invited my elder sister and me out on dates. That was even more painful for me. The school reunions were periodical. I figured the summer of 2013 might be my last opportunity. My younger sister was hounding me to go. I remembered the insistence of one of my nieces who also went to school there. She still refuses to set foot in Brockville. The other students had treated her best friend very badly, worse than they treated us. Her friend was the only Black in the school. But age and forgiveness won out for me. Brockville hadn’t been all bad for us. We did have friends, especially in the local Presbyterian church. They made us feel welcome. I went to the reunion feeling a little nervous as some of the old feelings returned. It started out at a cocktail party in the local yacht club. I had never been invited to the local yacht club when I lived there. I saw people I hadn’t seen since high school days. Some of them had been to one of my birthday parties, more than fifty years before. I had an old picture of that event. “We followed your career,” a couple of them said. I had written about my travels for the local newspaper. I was surprised. They had never indicated that they had read my articles. They had never written any letters to me. Then one of them started to say something like, “Did you ever feel hurt by…” But she was interrupted by the arrival of yet another friend from the past. She never resumed that conversation but I felt so good that someone cared how I felt in those painful days. At times they had left me in tears. The interest made the trip worthwhile. 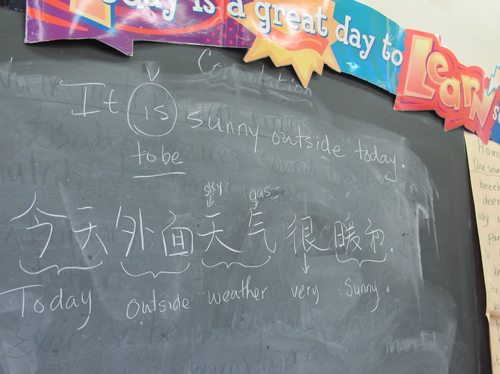 In one classroom I found a Chinese language lesson on a blackboard. In another I found an anti-bullying poster. Of course the times have changed. 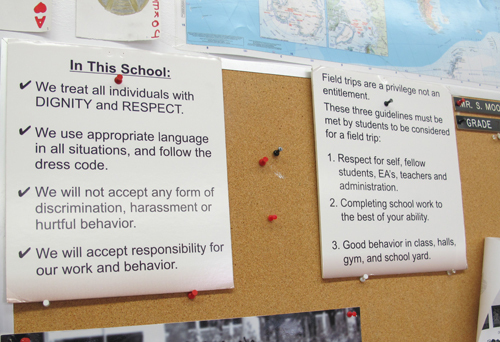 We’re in an age of political correctness. But I like to think the remarks were beyond just politeness. My old school mate’s interrupted question, however, made me wonder if I should be asking new immigrants to Toronto how they feel. Do they feel lonely and unwelcomed? Had anyone in Toronto ever hurt them because of race or their former nationality? Do they feel their home is Toronto yet? I really appreciated being asked. Such a tenderly written piece. Thank you for sharing your memories, both the good and the bad. Isn’t it amazing that no matter how far we’ve come, some of these ugly old tapes still play in our heads? It must have been so sad for you to grow up in a town with small-minded people. As a child, I went to a private English school with foreigners (in Finland) and I remember that for some time, my best friend was a little Japanese girl. Interestingly, despite it being the early 60s, I don’t remember getting any flack for that from anyone. It wasn’t until I came to Canada in the late 60s that I started to get treated as an “outsider”… Canada has come a long way… Nice post, Ruth! Thanks Francisca. It was sad but I think I became stronger and more international because of it. I discovered that staring back at people who stared at me became actually fun — how they averted their eyes when they realized I was looking at them. My mother reacted wisely by calling the bullies ignorant. Even in the ’50s, Toronto was wonderful, but in a different way than today. When I went to university here, I found I was no longer an outsider when I joined foreign student and Chinese-Canadian communities. From there, we worked to change immigration laws, which in turn have made Toronto especially the exemplary multicultural city it is today. It is always interesting to read about how canada used to be, a few decades ago. It is especially true when the person who experienced racism tells her own story. As a recent immigrant, I don’t feel this at all. In contrary there is a real openness from Canadians who understand that immigrants are part of their life and accept them. At least, this is my feeling. I wouldn’t stay here otherwise. but maybe others might have different experiences? Thanks Emmanuel. I hope others will tell their stories because we still have incidents of discrimination in Canada. My Vancouver relatives were discriminated against because they were “mixed” and they are in their twenties. Even in Toronto two years ago, I heard a man on a street-car yelling at a black woman with a baby carriage, telling her to go back to where she came from. Just ask locals how they feel about the Roma in Toronto. Ruth. As the saying goes, what doesn’t kill us, makes us stronger. Toronto – and Canada – can be grateful to you and people like you for nudging multiculturalism in the right direction. But yes, tragically, there are plenty of ignorant people out there still, but their ignorance is rarely targeted only towards perceived “foreigners” – they tend to be unkind in all kinds of situations. My partner and I absolutely love your blog and find a lot of your posts to be exactly what I’m looking for. Would you offer guest writers to write content in your case? I wouldn’t mind publishing a post or elaborating on some of the subjects you write related to here. Again, awesome web log! We love hearing about the multicultural experiences and opinions of our readers and look forward to hearing from you. in my journal daily. I’d like to start a blog so I will be able to share my experience and thoughts online. Please let me know if you have any suggestions or tips for new aspiring bloggers. Appreciate it! has a lot of advice. Good luck. Ruth.